While I was at the Point Mugu Surf Contest I picked up a whole line of sun protection products by a relatively new brand called Shaka Laka. What caught my attention was their face stick, since I love my Headhunters Face Stick more than any other type of sunscreen, but once drawn in, I noticed they also had a lot of other products such as lip blocks and regular sunscreen in tubes. I got to get my hands on a little of everything that day, and I decided to put my other sun protection products away for a little while and give these new ones a try. The lip block is my favorite of all the products I tried. Its called Shaka Laka Lip Blaka, and the flavors are awesome. The worst part about it is that I seem to always be licking my lips, and slowly taking off all the sun block I just put on. They had four flavors at the contest: Maui Mint, Classic Coconut, Exotic Berry, and a limited edition pineapple one. I have only tried the Exotic Berry and Classic Coconut, but I can only guess that the others must be really good as well. This was perfect timing for me to get some lip block because I think it was only a day or two after that I completely burned my lips staying at the beach all day. I knew I needed to start wearing lip block if I was going to be out that long, and luckily had my new Lip Blaka from Shaka Laka. I used it the next few weeks while my lips were recovering and it worked great. 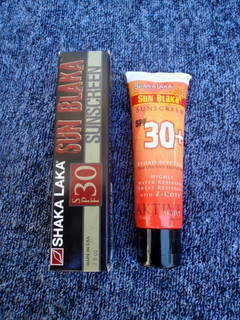 The sunscreen, called Shaka Laka Sun Blaka, also works very well. Lately I have only been using zinc-oxide products on my face so it sure felt nice to put something normal on that didn’t stick for the next 48 hours. The sunscreen worked perfectly for me. I used it a few days in a row right during the middle of the day and didn’t get burned at all. Oh yeah, and it also smells incredible. These guys really know how to make there stuff appeal to the senses. 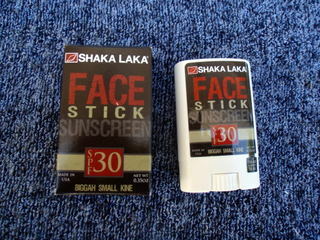 The last product I got to try out is the Shaka Laka Face Stick. I am actually not as big of a fan of this face stick as I am of their other products. One thing I notice using my Headhunters Face Stick, is that the way the stick is shaped makes it hard to cover every nook and cranny of your face that you want to cover, but with the zinc-oxide face sticks, you can at least see where it is applied and where you still need to put more on. The Shaka Laka Face Stick is a clear substance, and every time I use it I just know that I have to be missing a few spots. That put aside, the product actually does work well at protecting you from the sun, you just need to be extra careful to get it applied evenly. 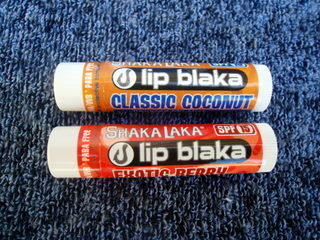 I’ve done some searching around online and can only find the Lip Blaka as of now, being sold for $2.00 a stick. I talked to the representatives at the surf contest and they said that the product is currently being sold at many local surf shops on the West and East coasts, and that they are working on getting into a lot more shops as we speak.